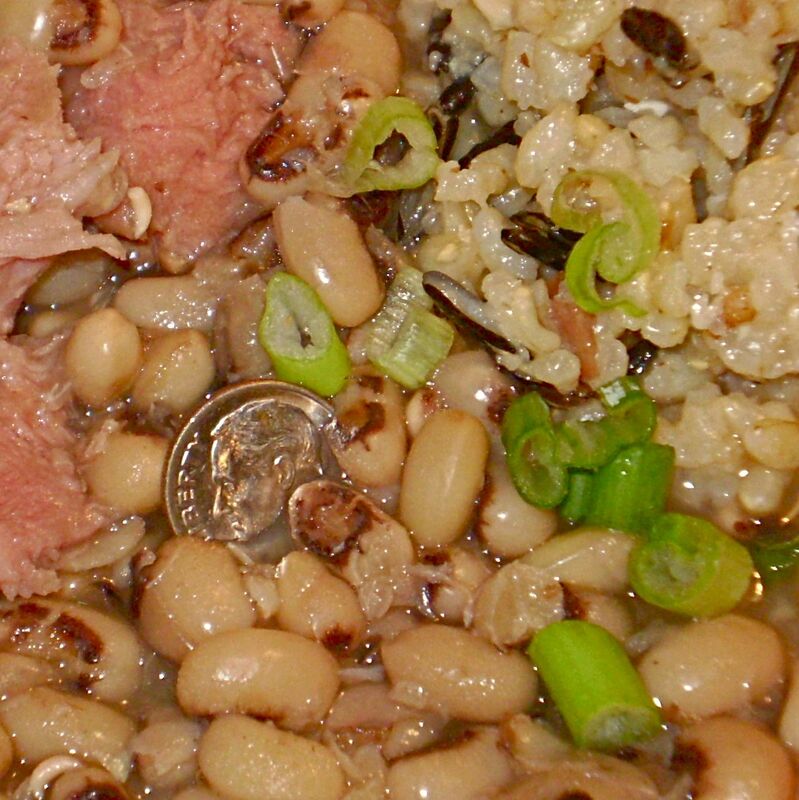 Black eyed peas and rice is a larrupin southern tradition for New Year’s day. Hoppin’ John is popular in a lot of places, but I like to make mine with plain water. You can buy black eyed peas fresh, frozen, or canned, but I usually cook them up from a bag of dried peas. Just so you know, dried black eyed peas cook faster than the time suggested on the back of the bag. If you don’t keep an eye on them you’ll end up with mushy peas. Today I put the peas in the pot, added a couple of inches of water, a chunk of already cooked ham pulled from the freezer, and turned the heat on kind of low so I could take a quick nap before my football game started. About an hour later they were tender and I was just about ready to eat. I cut/pulled the ham into smaller chunks and added salt and pepper to taste. The rice—a combo of short grain brown and wild rice which adds color and texture—was ready and waiting, steamed yesterday to go with sweet and sour stir-fried pork. I dipped up a bowl of peas with just enough liquid, a few chunks of ham on the side, rice on the other side, and green onions on the top of it all. The dime is for extra luck. The dime is a family tradition and it’s supposed to go in the serving bowl. The person who dips up the dime is blessed with extra luck. But since I’m eating alone today I plopped the dime on top for picture purposes.